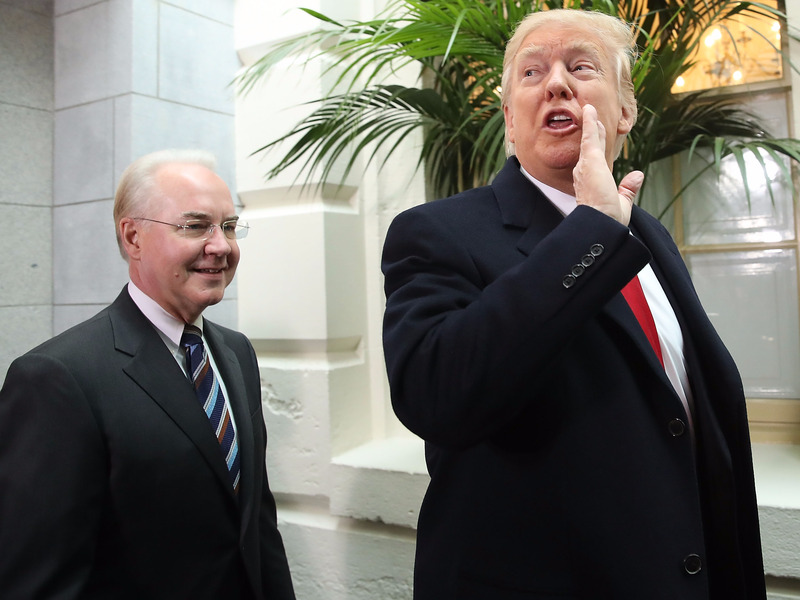 Mark Wilson/Getty ImagesTom Price and Donald Trump. The White House just named Alex Azar as its new nominee for secretary of Health and Human Services. Azar is President Donald Trump’s choice to replace Tom Price. Price resigned from the position in September following a scandal over his use of private jets that reportedly cost taxpayers more than $US1 million. Azar worked as HHS deputy secretary from 2005 to 2007 under President George W. Bush. Shortly after, he joined the pharmaceutical company Eli Lilly as a senior vice president of corporate affairs and communications and eventually became president of Lilly USA, according to his LinkedIn. He left Lilly in January 2017 and now consults and counsels with pharmaceutical and health insurance companies. As HHS secretary, Azar would oversee health agencies including the Food and Drug Administration, which regulates pharmaceutical companies including Lilly. Happy to announce, I am nominating Alex Azar to be the next HHS Secretary. He will be a star for better healthcare and lower drug prices!